Zetsche says new model will hit the show circuit. 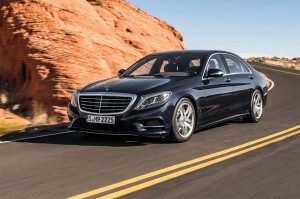 The S-Class sedan is getting an update that will be on display at the New York and Shanghai auto shows. Mercedes-Benz plans to present an updated version of the S-Class sedan next month during auto shows in New York and Shanghai, Daimler AG CEO Dieter Zetsche told the company’s shareholders in Berlin. “Technological paradigm shifts often result in the former top dog of a sector being replaced. But we’ve got everything we need to resist that pattern,” he said. “The future offers Daimler a multitude of new opportunities and we will do our utmost to take advantage of them,” said Zetsche, who added the company’s overall strategy calls for boosting new initiatives and well-established advantages. “In a few days, we will present the car that embodies this approach in New York and Shanghai – the new S-Class. For the past 45 years, this car has been regarded as the best in the world,” Zetsche said. “The new model will also set the benchmarks in automobile construction – for example, by taking a further big step toward autonomous driving,” he said. “The success story of the S-Class shows that every era that different expectations with regard to the best. Those who want to stay in front most constantly develop,” Zetsche said. The car has always been more than just a means of transport, and autonomous driving will allow a new dimension of individual freedom and safety, he said. Already today, series-produced cars from Mercedes-Benz can, if the driver desires, independently change lanes, apply the brakes in an emergency, or park themselves. As well as cars, the trucks and buses from Daimler are also pioneers for autonomous driving in their respective sectors. Mercedes-Benz has started this year very successfully and has continuously increased its unit sales compared with the prior-year period every month for four years. In the first two months of this year, the division sold 351,243 vehicles with the retail sales increasing by more than 15%. The Mercedes-Benz brand posted its 48th record month in succession in February with 153,862 units sold due to strong demand for the new E-Class sedan and the new E-Class wagon, ongoing strong demand for the C-Class and great demand worldwide for the SUVs. The positive development of unit sales continued in March, so the company expects to achieve its highest ever quarterly unit sales. This entry was posted on Wednesday, March 29th, 2017 at and is filed under Automobiles. You can follow any responses to this entry through the RSS 2.0 feed. Both comments and pings are currently closed.